Because it’s the end of October and the scariest night of the year is almost here, I’ve got a fun, easy and delicious recipe for you today to celebrate with! 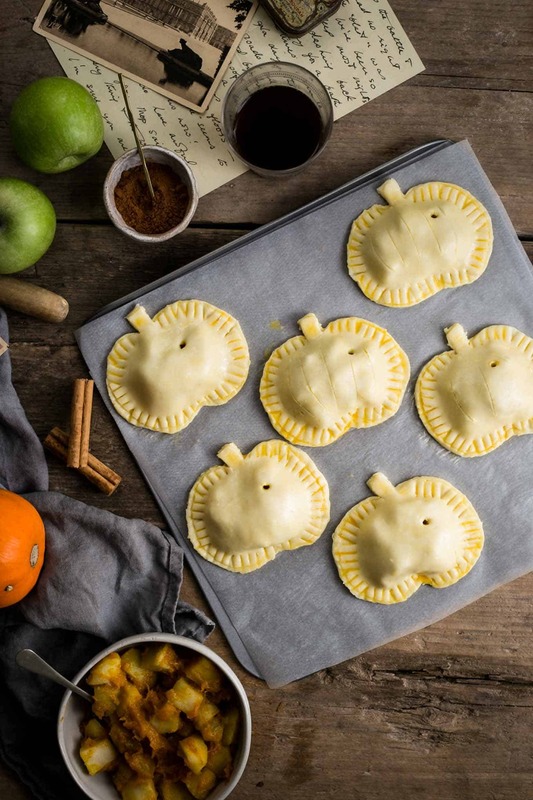 Spiced apple and pumpkin hand pies, which also could double up as a Halloween treat! 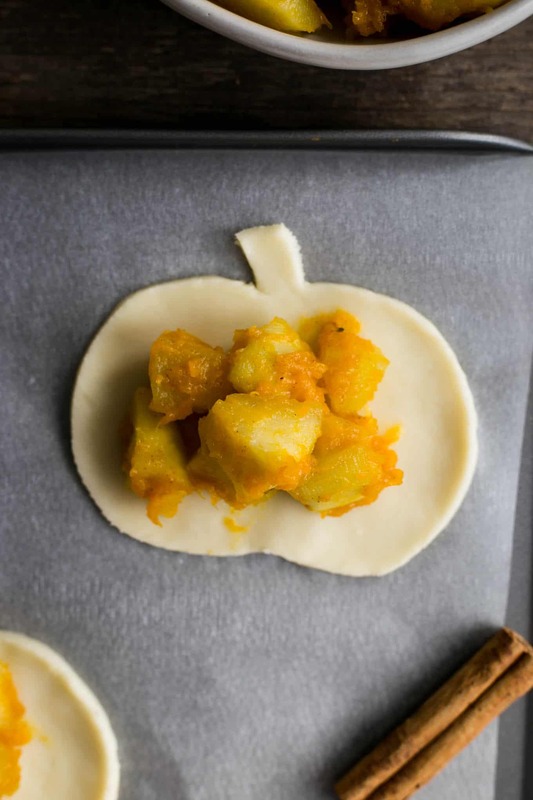 I’m sure most of you have celebrated Halloween over the last weekend, but just in case if you are in need of the last minute recipe for easy treat, these apple hand pies with pumpkin will do the trick (see what I did there?)! Since trying them for the first time last month, I’ve made 4 separate batches, and each one of them disappeared within minutes. So just a bit of warning, they are very addictive! 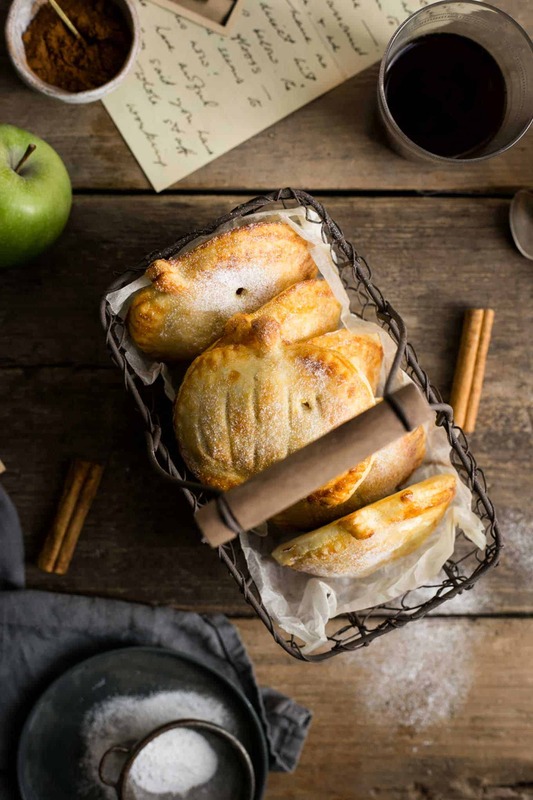 And speaking of comfort food, that is exactly what these spiced apple hand pies are. 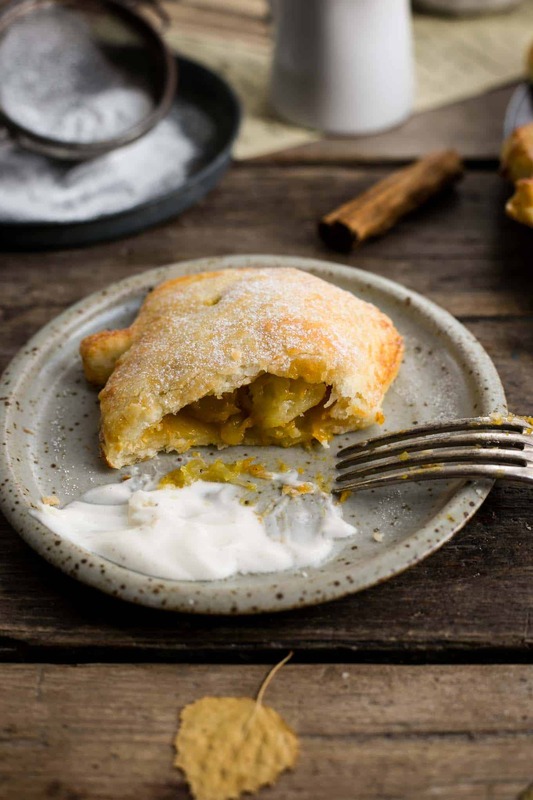 Delicious, buttery and flaky pastry, filled with sweet, cinnamon spiced apples and pumpkin. Sprinkled with some sugar, just for that extra sweetness. Add some vanilla flavoured whipped coconut cream on top, and you are on the staircase to heaven! The idea for this recipe came to me after seeing something similar in a food magazine, but it was calling for blackberries. However, if you are following along, I’ve made a promise to myself earlier this month. And it was to make sure every recipe posted in October (apart from that first one with Apple Pie with Caramel Sauce) had pumpkin in it. So I have experimented with some ingredients, and settled for this version with pumpkin, which works wonderful with apple and cinnamon filling. I absolutely love cooking with pumpkin, and this month has been a lot of fun, featuring all these recipes. Just to re-cap, and in case if you’ve missed them… I’ve made Pumpkin Scones with Cheese, Pumpkin and Roots Vegetables Goyoza and last but not least, Spiced Pumpkin Chocolate Bread for #virtualpumpkinparty last week. And to be completely honest with you, I’ve got no intentions of stopping using pumpkin in my kitchen any time soon. So there may, or may not be some more pumpkin spam coming at ya! 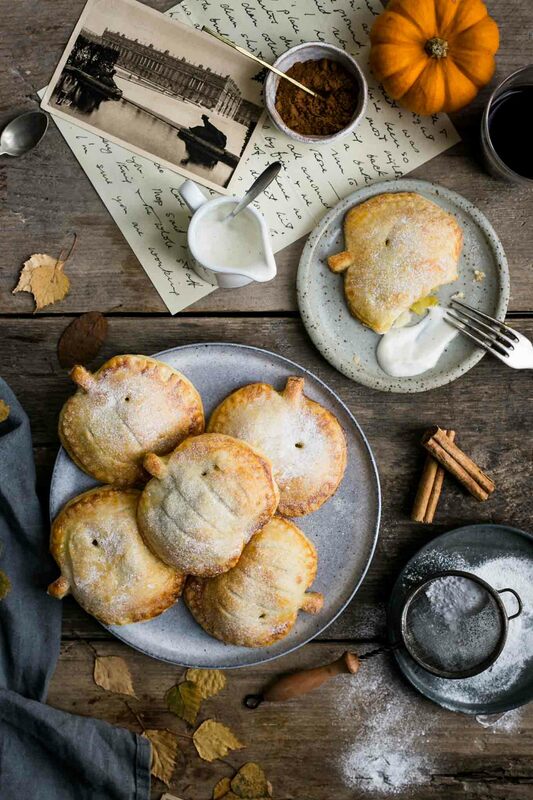 Anyway, back to these incredibly tasty spiced apple and pumpkin hand pies! They will be a great fun to make with kids, you can create your own stencils and go crazy with any shape you want. I have opted for pumpkin shape (obviously! ), but you can go with apples, pears, leaves, or anything else you can think of. Simply draw the desired shape on a piece of paper, cut it out, and then use it as ‘stencil’ for your pies. You can use the off- cuts of any leftover pastry to add even further details to your hand pies. You can even cut them out in the ‘jack-o-lantern’ style, just take care when ‘craving’ into the pastry. What’s also worth mentioning, is the fact that I’m using a ready, shop- bought pastry (I recommend Jus- Roll brand, which happens to be vegan too). You can of course made your own shortcrust pastry (see this post or this post for pastry recipe), however, for the ease and to keep this recipe simple, I have opted for a ready- made one. As for the spiced apple and pumpkin filling, make sure not to use too much of it, as otherwise you may struggle with sealing the pies. One tablespoon should be enough, but feel free to experiment with it, to satisfy your own preference. I have also found that keeping apples in a slightly bigger chunks, and not cooking them for too long in step 1, will result in a better shape of the hand pies. 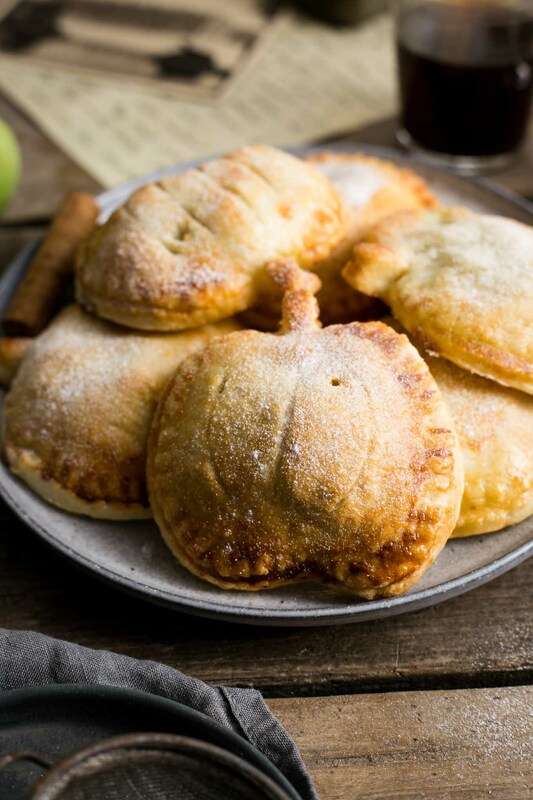 When cooked longer, apples will turn into mushy texture, and you will end up with puree, resulting in your apple hand pies being flat. So to keep them nicely packed, have some chunky-ish pieces in there! 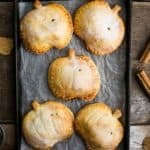 These spiced apple hand pies with pumpkin are best served warm, however, you can store them in air-tight container overnight and re-heat them gently the next day. Just in case, if by some miracle, you still have any left! So that’s it for now, let me know how did you spent Halloween, I would love to know! And I really hope you will enjoy today’s recipe! Until next time & have a good week! 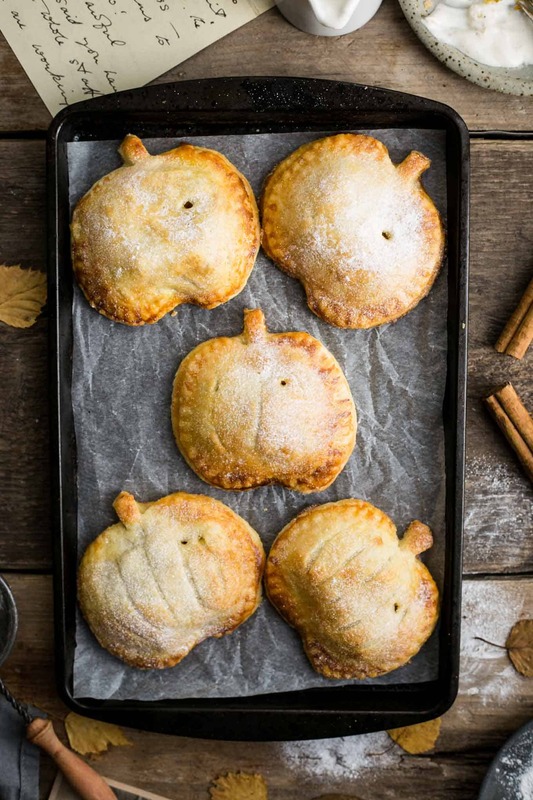 Delicious hand pies with spiced apple and pumpkin filling. Fun and easy to make treat for Halloween! Place apples and golden caster sugar in a medium saucepan and add 2 tbsp of water. Cover with the lid and cook for 5 minutes, until the apples are soft. Set aside allowing ti to cool slightly, then add pumpkin puree and cinnamon, and mix it gently. In a small bowl, mix together maple syrup and cornflour and stir into apple and pumpkin mixture. Unroll your pastry, and using 10 cm round cookie cutter (or a stencil of your choice), cut 12 identical circles. Spoon the apple and pumpkin filling onto half of your pastry circles, ensuring to leave about 1 cm boarder around the edge. Brush the edges of pastry with milk, then place a plain pastry disk on top. Make a small dents in the top and bottom of your pies, to form pumpkin or an apple shape and seal the edges with the fork. Poke a steam hole with a skewer, brush the pastry all over with milk, then place in the fridge for at least 30 minutes. Heat the oven to 200C (180C fan), and bake the pies for 20 minutes, or until golden brown. Sprinkle with the sugar, and leave to cool for 15 minutes. Enjoy served with ice cream, caramel sauce or custard. * I have used a pumpkin stencil, it was about 10cm wide. * You can save all the off- cuts of your pastry to cut out more decorations (stalks or leaves), or to make even smaller pies. I’ve been making them every week for the last couple of months, they are probably the favourite treat in our house at the moment! Really glad you like the recipe and the photos, thanks so much! Ela, just let me know when you are coming and I will have three of these waiting for you! I’m so happy to hear you like them and the photos, I really enjoyed taking these pictures, and it makes me so happy to hear you like them too! This is soooo cool! I’m trying this later on tonight with kids! Thanks so much for sharing! Hey Cheryl & thank you so much!!! I hope you had a chance to try them out and enjoyed them with kids! These are adorable! I think the pumpkin and apple combo sounds delicious, though the blackberry version sounds amazing, too! You are so right Melissa! Both versions are totally delicious, and they could be made with so many different fruit combinations! These have to be the cutest hand pies ever! Love how they’re cut out like pumpkins! Aww thanks so much Jess! Wow, these look seriously good, Anna! These are the cutest hand pies ever! Thanks Evi! They are probably the cutest thing I’ve ever baked! These are so adorable! I love them!! I’m so happy to hear that Sarah! haha, Tania, I need an extra long staircase to work them out too! I’m absolutely chuffed to hear that you guys enjoyed them! Looking forward to our date! These are adorable! They also look delicious. Such a fun fall treat. Thanks so much, they are great for this time of the year! Glad you like them too! I’m really happy to hear that you like them! These are the cutest pastries! And I can imagine how delicious they taste! Thanks so much dear Amy! Thanks so much for stopping by and for this lovely comment! You are absolutely right, they are great not just for Halloween but any other day of the year too! Oh my goodness! These are awesome. I made these today for a teacher appreciation luncheon tomorrow. The teachers are going to LOVE them! That makes me soooo happy! I’m over the moon to hear that you’ve made them and like them so much! I hope the teachers loved them too! These are so beautiful! And such a yummy combo! Perfect for the fall!!! They are fun little treats, especially at this time of the year! Glad you like them. Aww, how cute, They are in the shape of pumpkins, filled with pumpkin. Perfect for Thanksgiving I think. Love the flavors you have going in there. Sounds yum. thanks so much Veena! they will be a great crowd pleaser for Thanksgiving! 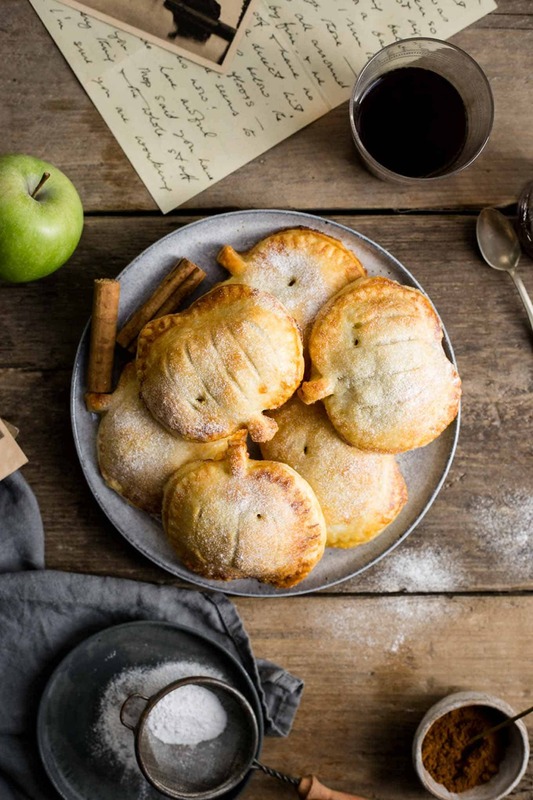 Oh my, these hand pies are beyond pretty and I love love love your photography! Puts me right into cozy weekend mode! I will put these on my to-bake list! This counts as self-care, right? That totally counts as self-care Kiki! 🙂 And thanks so much for stopping by and this lovely comment! I hope you will like these handpies! OH! These are adorable! I make something similar last year for Thanksgiving and everyone loved them! Love the idea of pumpkin AND apple! Thanks Anna, great to hear that you’ve also been making handpies! They are great for family or friends gatherings and always do the job! These hand pies are so delicious looking! 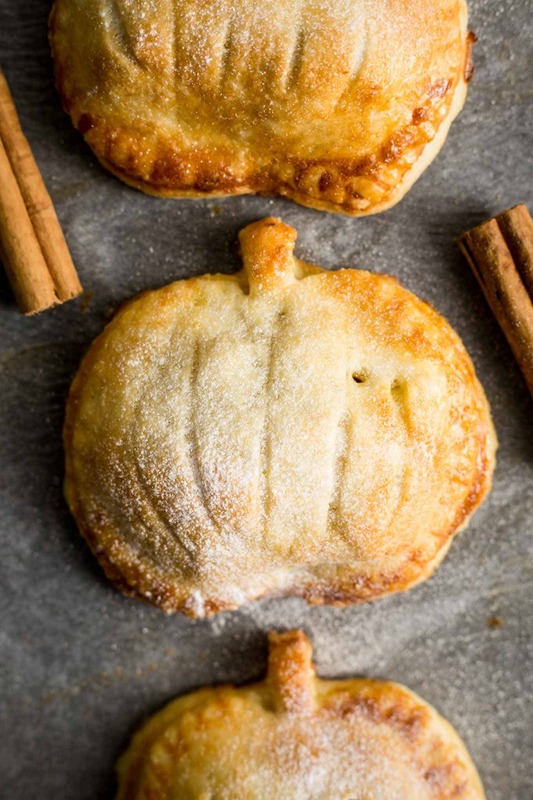 I love apple hand pies and I love pumpkin hand pies so it only makes sense to combine them into something brilliant like this! Fantastic for the holidays! Thanks so much Jenni! Glad you also like the flavours, apple and pumpkin are the stars of this season, so I really wanted them both in there. Match made in heaven! You’re welcome Anne, glad to read you like them! Thanks so much! So beautiful. Lovely combination. Perfect fall treat! I have never tried pumpkin and apple together! Sounds like a great combo and your pies look awesome. Thanks so much Vanessa! And you MUST try this combination! It’s my absolute favourite at this time of the year! Oh wow – these hand pies are so cute! 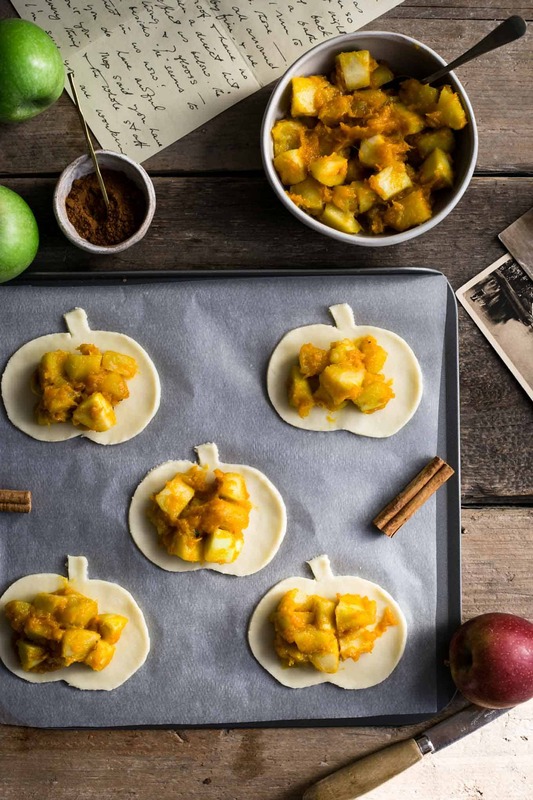 I love that you paired apple and pumpkin together for these yummy treats! Saving to make later! Hi Holly! Thanks so much for stopping by! I hope you will love them as much as I do! What a tasty treat! 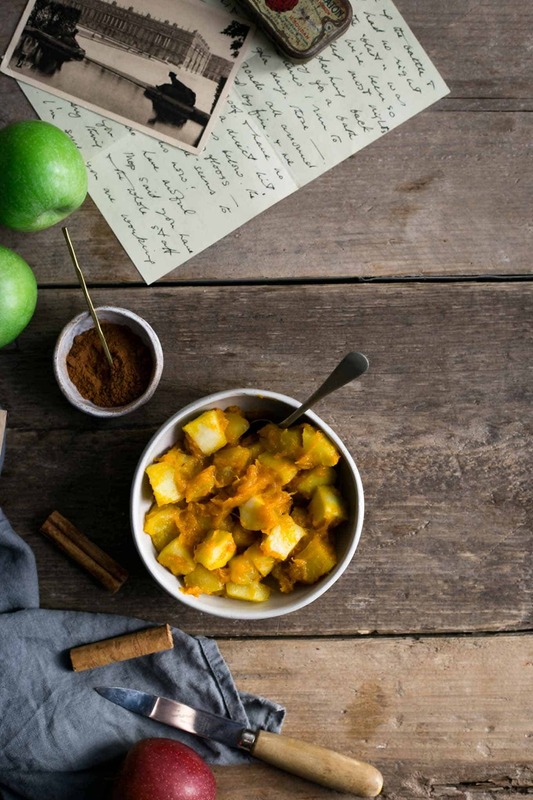 Delicious flaky pastry,cinnamon spiced apples and pumpkin. with vanilla flavoured whipped coconut cream on the top! My family will love these and your photos are lovely! My mouth is watering! Thanks so much Emily! I’m a huge fan of apple and pumpkin combo, they both work so well together! And couldn’t be happier to read your lovely comment, thank you so much! how much cinnamon do you add, I can not see it on the recipe? Hey Stacey, 1 tsp of cinnamon should be enough. Hope you will enjoy these handpies! How much cinnamon do you use? Hello Brianna! Thanks for stopping by! It’s 1 tsp of cinnamon. Hope this helps! Ha! Just saw that someone else asked that same question yesterday. Thank you!